Hello, I’m Donovan and this is The Glendale Self Storage Review. I was always one of those people who never understood the need for storage, or at least so much storage. I would drive down a road and see two, three, four storage unit companies and ask myself who are all these people who have so much stuff that they’ve built all these storage units? Is it like a single company/industry that’s around here using all this storage? It didn’t look or feel it. Then, as I got a little older, it wasn’t so much that I started accumulating that much stuff personally, but I started moving and buying a home and then moving again and then I started painting and selling my paintings and I (if I wanted to stay married) needed a place to store my paintings until they sold online. And so it was that I learned the value and process of self-storage. I want to use this knowledge to help other people with their moves and storage projects. 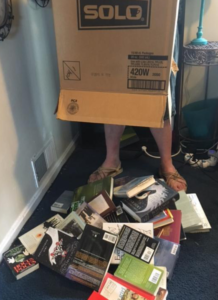 I’ve been through it all, right down to having a bunch of books fall right through the bottom of a box. You’ve got to take that extra precaution of taping up the edges of any used boxes. Or else…. I realize there are already big brand-name review sites out there that cover practically everything and in practically every location, including Glendale. But I wanted to create a review site with a little more focus. In addition to reviews of storage companies in and around Glendale, I want this site to provide some basic tutorials for self-storage projects. I want it to be a storage guide for the heat and specific climate that exists in Glendale, Ariz. I want it to highlight the kinds of people and projects that are common to the local storage scene, starting with the population and economic growth that this part of the Valley of the Sun is experiencing. So, welcome to The Glendale Self Storage Review. I hope it makes your next storage project a little easier.